One of the seacoast’s largest economic drivers is the Portsmouth Naval Shipyard. The shipyard employs a tremendous amount of workers and pays them handsome sums of money, which fuels the growth of our local economy. This world class facility operates on nuclear submarines right in our own back yard, which is both a fascinating and horrifying fact given the potential for nuclear disaster. Much of the shipyard remains a mystery for security reasons, and you can only gain access from two gates on land in Kittery, but it is an imposing neighbor with beautiful industrial appeal. 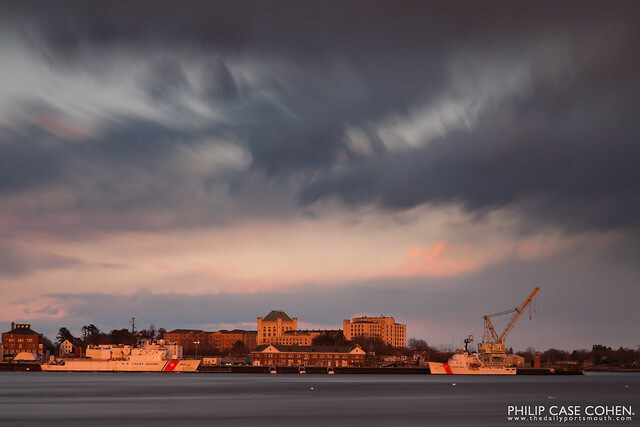 In this shot, two Coast Guard cutters are docked on shore in front of the Naval Shipyard Prison (Alcatraz of the East) and beneath some quickly moving clouds illuminated by the setting sun. What number is on the large cutter? The Campbell (909) and the Tahoma (908) used to be in New Bedford. Mike was on the Tahoma for a while out of there.